About a week before my wife, K.G, and I flew to Alaska to start our journey, we emailed the owner and founder of Rogue Panda Designs, Nick Smolinske, about getting us some frame bags for our bikes. We had found the website of his company while doing some research on different options of panniers to carry our gear on our bikes. His website and products stood out due to the cool designs and colors he was using instead of the same old traditional black or gray bike bags. Rogue Panda Designs bike bags are made right here in the USA, in Flagstaff, Arizona by Nick and his small staff. When Nick started the company it was just him and a sewing machine, working out of his house. Now they've got a shop and a team of employees turning out products. "Being able to create jobs is a great feeling, and I couldn’t be more proud", praises Nick on the company's website. When ordering a bag on the website, you can simply choose from already existing products or have yours custom made like we chose to do. 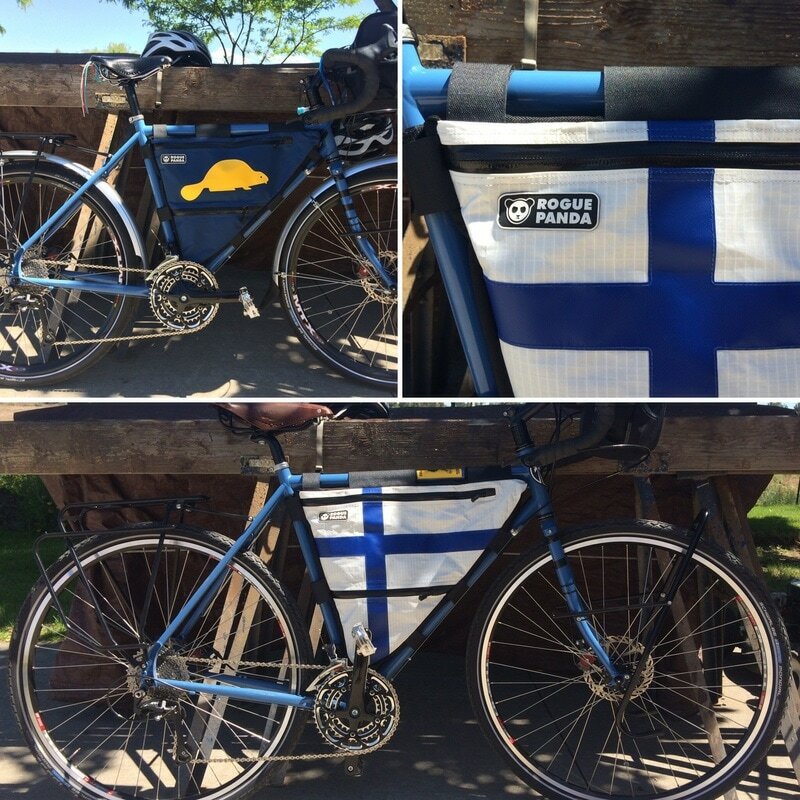 I wanted my frame bag with the Finnish flag on it and K.G wanted the Beaver from the Oregon flag on hers. Since finding the site last minute, we also wanted the bags pronto since we had our flight to Alaska the next week. Nick said "No problemo" to all our demands and he even overnight-ed the package to us since we were running out of time. 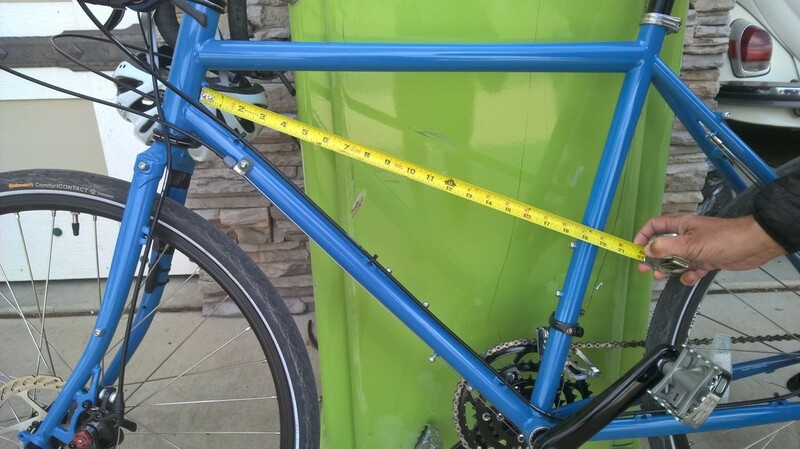 Ordering our custom made bags was as easy as riding a bicycle, all we had to do was to take a picture of our bike frames with a ruler in it. See the picture below. ​There was no need to cut a template out of cardboard and mail it in. This also made the ordering process a lot faster. I had my doubts about the fit but I was glad I was proven wrong, the bags fit perfectly. We've been using them for a whole year now, 9,400 miles so far. Through the muddy roads of Dalton Highway, three weeks of solid rain in Oregon/California coast, desert sand storms in Baja California and now in the rainy season in Central America. These bags are bombproof, there's no doubt about it. The zippers are usually the weakest link in products like these but their doing great, we open and close the bags about 20 times a day. The stitching on the seals is holding, no leaks even after a thunderstorm in Panama where we thought we would drown on the highway if the rain didn't stop. There is a removable divider in the full frame bag in case you need to make room for larger items or section things off. We keep our 3 liter water bladders in the top compartment and heavier things like the tools are in the bottom compartment. Having the weight in the middle of the bike helps a lot with balance compared to having those heavy items in your side panniers. My mainly white Finnish flag is not so white anymore, but that's expected after the beating I've given it and Nick did warn me in all fairness. The bags have been a big conversation piece on our trip, a lot of cyclists have been asking about them and it feels special especially to me to have a little bit of Finland close to me when I'm so far from it. We can highly recommend the quality of the products and their customer service, it's a nice addition that their made in Arizona, USA employing cool outdoorsy people. So there you have it. Now go buy one already!